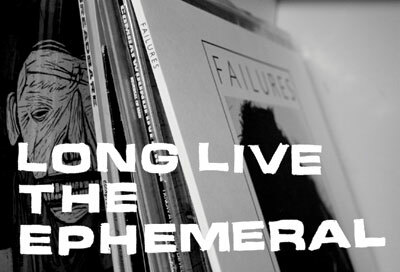 “FONTANELLE GALLERY presents ‘LONG LIVE THE EPHEMERAL’, an exhibition featuring prints, drawings, and paintings by renowned artists from all across the US who have created album artwork for punk and DIY bands. artists included in the show: MELINDA BECK, DEARRAINDROP, BRANDON EVANS, JORDAN ISIP, RICH JACOBS, ADAM JURESKO, ASHLEY MACOMBER, MARK McCOY, SAMMcPHEETERS, CHRISTOPHER NORRIS, BRIAN ROETTINGER, SERIPOP, DREW SPEZIALE and CHRIS TAYLOR. Curator RYAN JACOB SMITH lives and works in Portland, OREGON. He graduated from the Art Center College of Design in Pasadena, California in 200l. He has exhibited his work in Brooklyn’s CINDERS GALLERY, among other venues. This is his first curatorial endeavor.